Win upto 1 Million, or 10 Million, or 100 Million! Did you know? 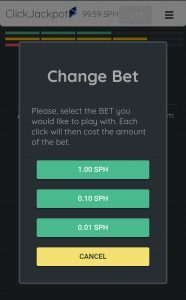 You can now choose and change your bet in ClickJackpot One Click Millionaire game. You can start to play with initial “cent” game, which means that each click will cost you 0.01 SPH. Once you get more skillful and advanced player, you can then move into 0.10 SPH and 1.00 SPH bet and win even more. With one cent SPH click (0.01 SPH), you can win upto 1,000,000 SPH. With same principle, with 0.10 SPH click you can win upto 10,000,000 SPH and with 1.00 SPH per click, the grand jackpot is upto 100 Million SPH.